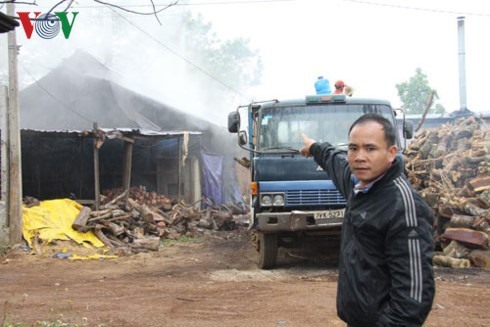 ĐẮK LẮK — Smoke from charcoal furnaces is threatening the environment around Cư M’gar District in the Tây Nguyên (Central Highlands) province of Đắk Lắk, affecting residents’ health. People in Cư Dliê M’nông Commune have reported that they are forced to inhale the smoke and dust from charcoal incinerators in the locality every day for the last several years. Productivity of hundreds of hectares of crops has also been affected, the Voice of Việt Nam reported. Although people have repeatedly petitioned local authorities, the situation has not been resolved. In other districts, people have also chopped trees in forests for production purposes, thereby destroying the natural forest cover, residents told the media. Trần Quốc Tiến, a resident, said a dozen charcoal incinerators of Phúc Minh Co Ltd consume tens of tonnes of firewood everyday and discharge smoke and dust directly to the environment, seriously affecting the health of people, animals and plants. The company was licensed and put into operation at the end of 2011 with three incinerators, with capacity of 20 tonnes of firewood per day. The capacity has now reached up to 300 tonnes per day with 12 incinerators. “We have lived with the smoke and dust for six years already. We cannot live like this anymore. Some children are suffering from severe pneumonia,” Tiến said. The incinerators have also affected to the yield of coffee plants, the main crop grown by residents, he said. Thái Văn Ngân, a senior villager from Tân Lập Village , said besides the negative impact on the health of people, animals and plants, trucks transporting firewood for the company have also contributed to the destruction of the inter-village road system, making the road very muddy in the rainy season and dusty in the dry season. The residents have reported the incident to the authorised agency several times, but the problem persists, according to Ngân. Trương Văn Chỉ, chairman of the People’s Committee of Cư M’gar District, said the inspection team had worked directly with the company many times and penalised and asked it to fulfill its commitments to address the issue, but the company still repeated the violation. He promised that the situation be resolved soon and said the company’s licence would be revoked if it continued to violate environment regulations. Along with Cư M’gar, other districts also have many charcoal incinerators. According to the rules, companies are permitted to use firewood from agriculture and coffee plants. But recently, they have also been utilising illegal sources from natural forests, leading to difficulties in the protection and development of forests in localities.